As NASA's plans to returns astronauts to the moon face cancellation,there remain many reasons to go back, researchers said. The recent dramaticconfirmation of water there spotlights how answers on the moon could shedlight on the history of life on Earth. It also suggests that resources on themoon could make it helpful as a stepping stone into space. "It's ironic that we're trying to abandon the moon at thevery moment it looks even more inviting than we thought it was," saidlunar geologist Paul Spudis at the Lunar and Planetary Institute in Houston. NASA declined to comment due to the ongoing debate about the futureof its human spaceflight program. The rocks that have been collected so far from the moon are morethan just ornaments in a museum. 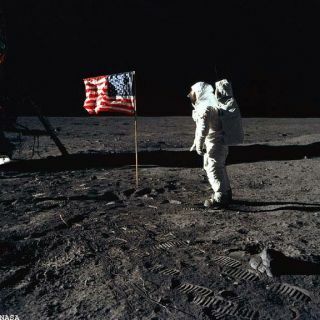 By going to the moon, "we developed acompletely different view of how evolution works and the history of life onEarth that came completely out of left field," Spudis said. For instance, after the Apollo missions went to the moon, theydiscovered the meteor impacts that pock its surface could leave behind shockedquartz and other chemical and physical signatures. "That seemed pretty esoteric, and didn't seem as if it hadany practical application, until we found evidence of shocked quartz grains atthe Cretaceous-Tertiary boundary, which coincides with the mass extinctionevent that claimed the dinosaurs," Spudis explained. "Enriched levelsof iridium had been found at the boundary, but some had said those might havebeen due to volcanic activity. The shocked quartz is what really proved an impact,and was totally unexpected." The moon could hold other secrets regarding our world, includingbits of Earth. Tons and tons of rock kicked off the planet by meteor impacts may verywell have landed on the moon, carrying secrets not just of the early agesof the Earth but even possibly microbial fossils. "The histories of themoon and Earth are tightly linked, and one illuminates the other," Spudissaid. Themoon also serves as a window "into the distant past of all the terrestrialplanets ? Mercury, Venus, Earth, Mars,"
For instance, "there are what look like blowholes on thelunar surface ? you have extremely young patches that have virtually no impactcraters superimposed on them," Spudis said. "Does that mean there arevolatiles venting from the deep interior?" A telescopeon the far side of the moon could also detect signals impossible to see onEarth or even in orbit nearby. "It would use the moon as a shield against radar noise fromEarth, and of course there's no atmosphere to interfere withobservations," Spudis noted. Scientists have conjectured that such atelescope could see extraordinarily faint light from mysterious early ages ofthe universe. Andthe very airlessness of the moon could shed light on all the other airlessbodies in the solar system. "Wehave samples from the moon that can tell us about the same kind of spaceweathering from solar wind and micrometeorite bombardment that asteroids gothrough," Taylor said. Themoon isn't just interesting for the sake of science. It may also be critical tolife off Earth. "It'snot about building a moon base so I can go out and perform moon geology, but toharness material and energy resources there to create a sustainable humanpresence," Spudis said. "If there's any use for human spaceflight atall, it's to create a sustainable presence off-Earth. If you're not doing that,you might as well send machines." Thewater at the moon's poles is useful not just for life support, but also to makepropellant for spacecraft, he noted. Moreover, the poles may also be home toareas of near-permanentsunlight. "Atthe equator of the moon, one can go from 14 days of light to 14 days ofdarkness," Spudis said. "That not only means that you can't generatesolar power from sunlight during the nighttime, but also huge temperatureswings from 100 degrees C (212 degrees F) to -150degrees C (-238 degrees F), which can be hard on equipment we bring up there.In areas always blazing in solar illumination at the moon, it always remains aroughly toasty -50 degrees C (-58 degrees F), so it's easier to controltemperature." The moon is also loaded with fuel for nuclear fusion in the formof helium-3, Taylor explained. "There's a tremendous amount put in thesoil by the sun via the solar wind," he explained. "And if you do iteffectively, you end up with no radioactivity." Assuch, the moon could be fundamental to learning the lessons needed forprolonged life in space. "We'd want to learn how to live off where you arewherever you go," Spudis said. Althoughthe Constellation program designed as NASA's next human spaceflight program isnow in jeopardy, "it's not dead yet ? Congress still has to weighin," Spudis said. "But whether the U.S. government or some othergovernment or private industry goes back, somebody someday will do it, becauseit just makes too much sense not to."